Discussion in 'Gibson SG' started by SoldanoSG, Apr 12, 2019. I seen a 72 with same heel as 396xxx, which makes it fun because I thought ebony board SG standards we’re only a 2 year gig. SG standard, Biddlin and cerebral gasket like this. I like Harmonica Bridges and Volutes. Since they apparently aren't "Vintage" we need a "Norlin" forum. Your post suggests that you have doubts they are 74's. Serial numbers from that era are unreliable for determining exact build date of guitar. Have you checked the pot codes? If original, they will indicate earliest year the guitar was built. I’ll check pots for sure..& thanks for info. Here's my '74. 115XXX SN. Pots date to 74. Stepped heel. Both these SG’s sound nothing short of amazing.. I have lots to compare them to & there so clear & raw it’s stupid.. The one with all four 72 pots indicates late 1972. The one with four different pots indicates that it could be 1972. Small block inlays were not in use on SG Standards until 1972, so cannot be 1970. The 70 pot was probably a leftover and the other two that are newer were probably replaced at a later time after 1972. There's also the possibility that it could be 1974 and all the older pots were leftovers. PermissionToLand and rotorhead like this. Typically '74's have the bridge pickup up very close to the harmonica bridge. Here's some examples. The first one I own and swapped the bridge, second one I sold years ago and the third is a photo I found on the internet. Same here. Even with the bridge swap there's a much larger spacing between the bridge and pick up. Also noticed the pick guard on yours extends slightly above the neck pick up. Same on mine although it's tough to see at this angle. In the pics posted above it looks even with the pickup ring. 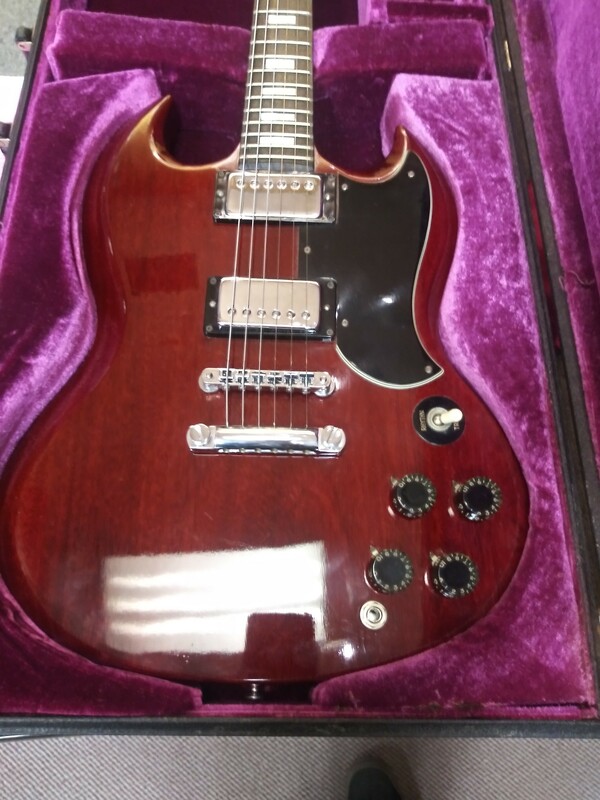 I noticed this when I was considering buying this one but saw enough pics of SG's with the same bridge spacing and pick guard placement that I figured it was a manufacturing change that happened at some point around '74. In my head there must have been a gotta bevel it to flush person working that stage . Most pics I see are one way or another . Soft easing or hard to flush bevel..
On the pick guard issue, it seems as if they just relieved material equally from center of pick guard screw between the pickups .. that would make the pick guard higher but still retain center screw placement. I have seen no pictures that show off center pick guard screw & dought they had differant plates made for the away from bridge configuration. All just a guess on my part. Another thing I noticed is these is the bevels are all over the map for the same year, some deep & some not, etc. totally cool as human hands are the culprit.. I love that .. I’m a sucker for inconsistency..my modern SG is very cookie compared .. but still awesome. Totally agree. These definitely have character. Something about the feel, just a great playing guitar. Has that old guitar smell that I love. Anyhow, in the 3 pics posted by Flognoth, 2 of the 3 have bound necks. Wouldn't that indicate either earlier or later than 74? I don't remember which but I thought none of this model year had neck binding. I have never seen one with a smooth heel, and Gibson kept using that same stepped design until the '80s, so I think the likely answer is that it was refinished and re-shaped. The Cherry on that one is also unusually dark. The pots being from several years before it was made is actually not uncommon. The '72 pots both denote the 2nd to last week in the year, so they are not really that old, about a year. But IDK why Gibson seemed to lose and rediscover old batches of pots so often. Maybe they were at the bottom of the barrel and just had new batches dumped on top of them several times before getting used? Thank you for the excellent info.. 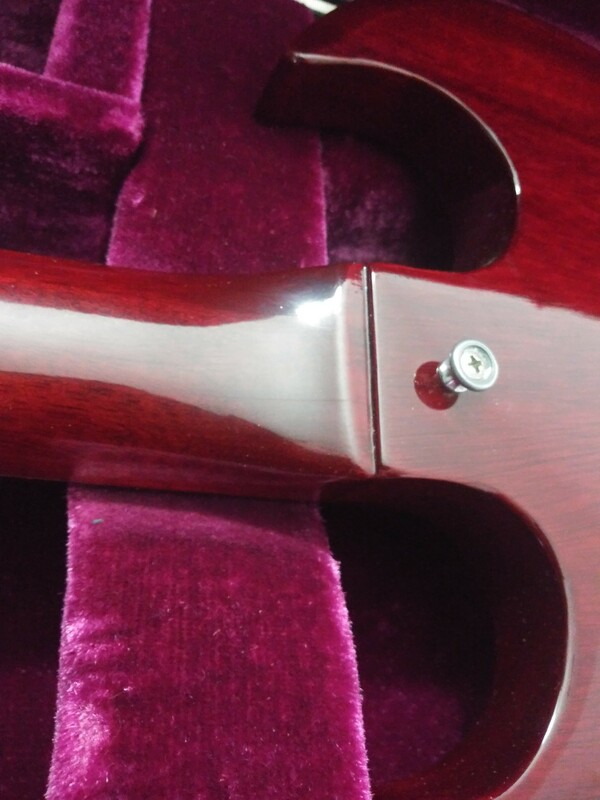 I recently read a post about someone buying a brand new 1970 sg in 70 that had 66 pots in it:.. Very well could be repair in the flat 74... somebody did a superb job if so..